Now that you know how cool it is, let’s install and try out the product. 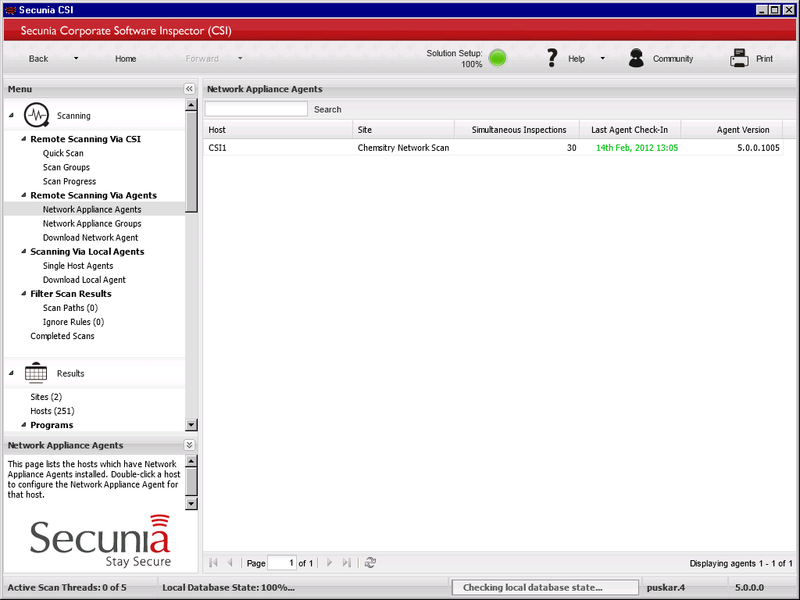 This post will cover the initial install and configuration of Secunia. Part 2 will cover network scanning and actually publishing a patch. A workstation to run CSI Console. A server to run CSI in Network Appliance mode. A SCCM Server with the SUP role configured. A user account for the Network Appliance service that has admin rights on all target\client computers. 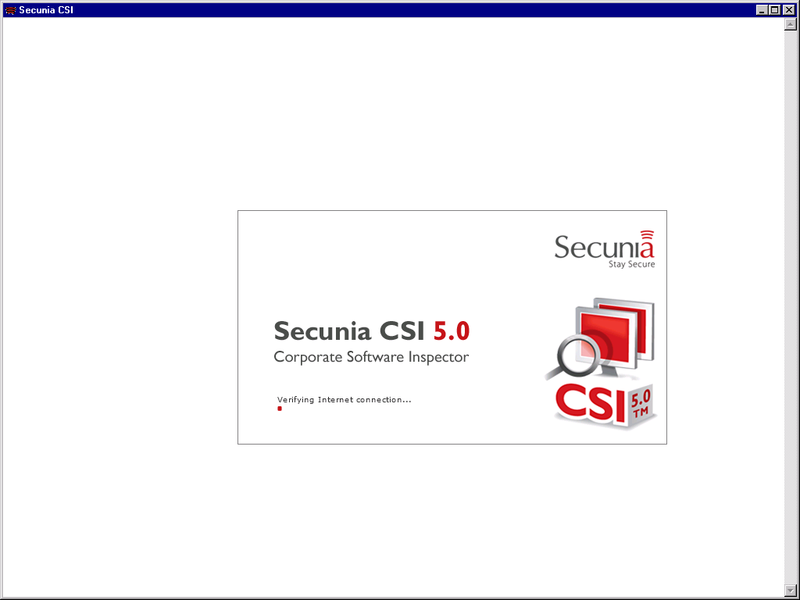 Download the Secunia CSI Console from the following web page (after login). Double-click the setup file “CSISetup.exe” to begin installation. 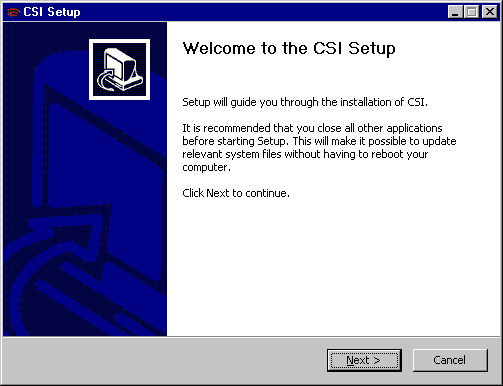 On the ‘Welcome to the CSI Setup’ screen, click “Next”. 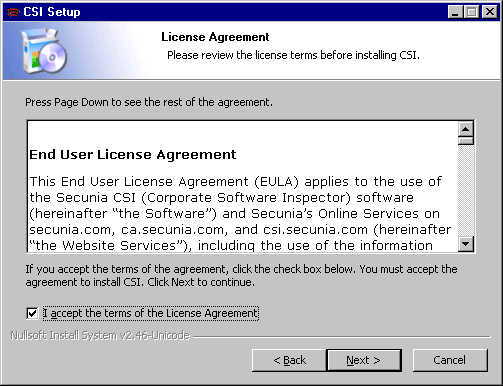 On the ‘License Agreement’ screen check the box and click Next. On the ‘Readme Information’ screen click “Next”. 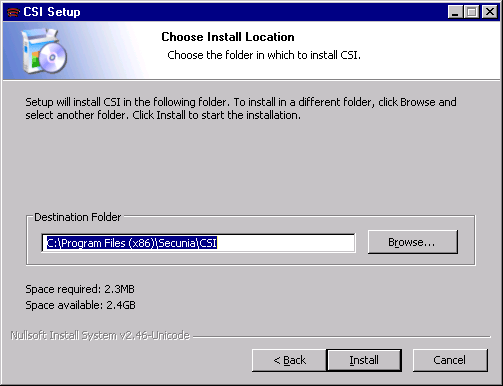 On the ‘Choose Install Location’ screen click “Next”. On the ‘Completing the CSI Setup’ screen click “Finish”. 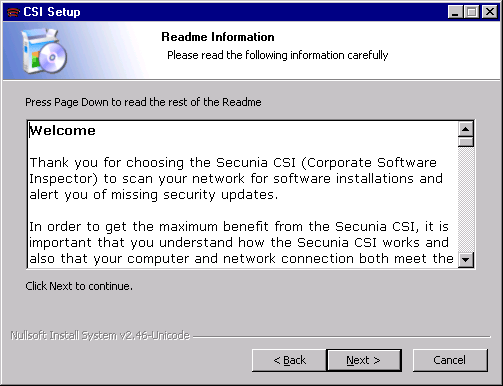 When prompted to launch Secunia CSI, click “Yes”. 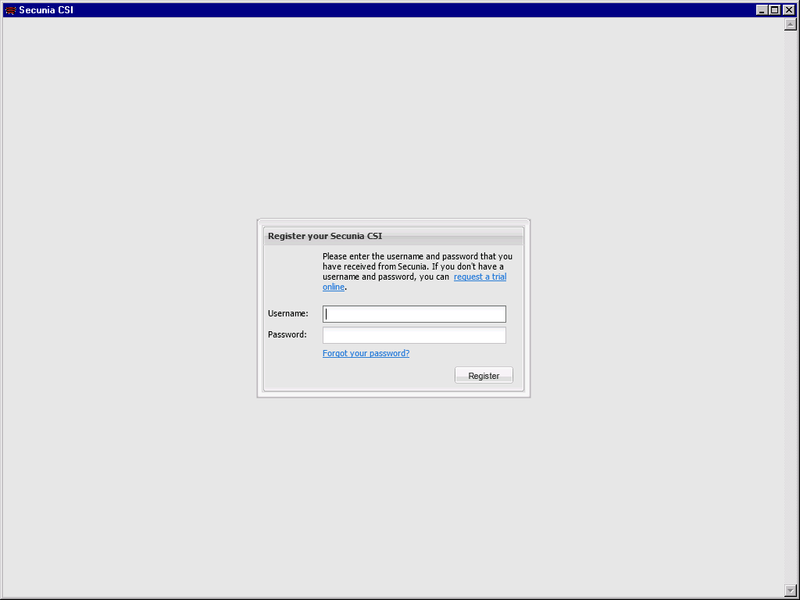 Login to the CSI Console using your Customer Credentials. Secunia will load if your internet connection is active. Congrats! The software is installed and launched. 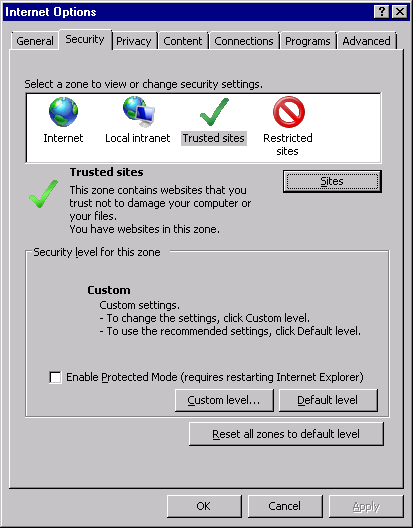 On the “Security” tab, click “Trusted Sites” then click the “Sites” button. On the Internet Options window, click “OK”. 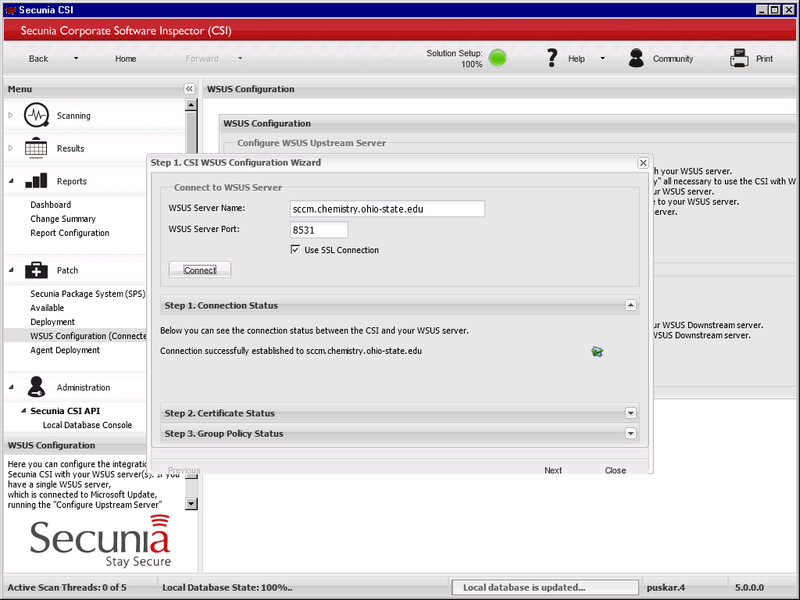 In Secunia CSI navigate to Patch -> WSUS Configuration, then click “Configure Upsteam Servers”. If using SCCM, enter the SCCM server hostname and port, then click “Use SSL”, then click “Connect”. The default SCCM WSUS Port number for SSL is 8531. 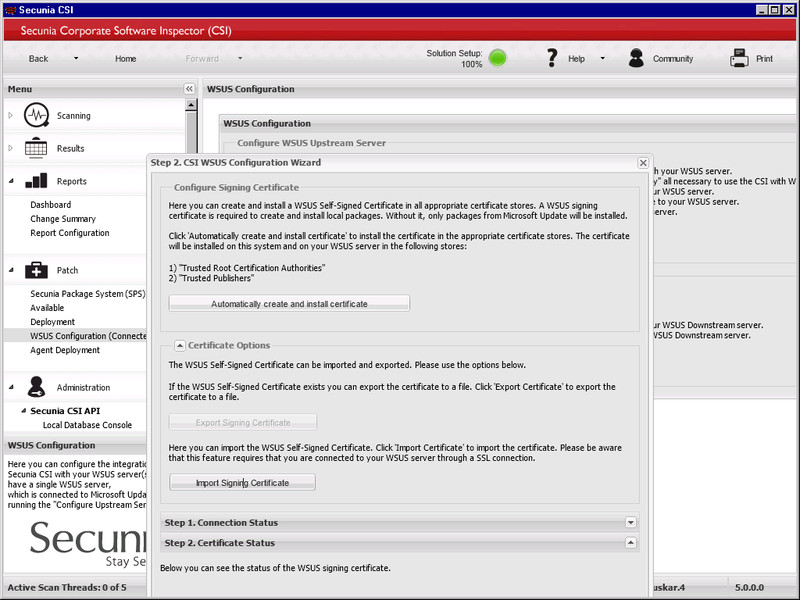 Next, Secunia asks you to configure the certificate. If you already have a WSUS Signing Certificate, for example from using System Center Updates Publisher, then close the wizard because parts 2 and 3 are not necessary. If you are sure that you do not have a WSUS Signing Certificate, click “Automatically create and install certificate”. I can’t show the wizard step 3, because importing a new signing certificate would break my WSUS server. However, step 3 just creates a group policy object for the distribution of the certificate to your active directory clients. The process can be seen manually in my previous blog post “Pushing the SCUP Certificate to Clients“. 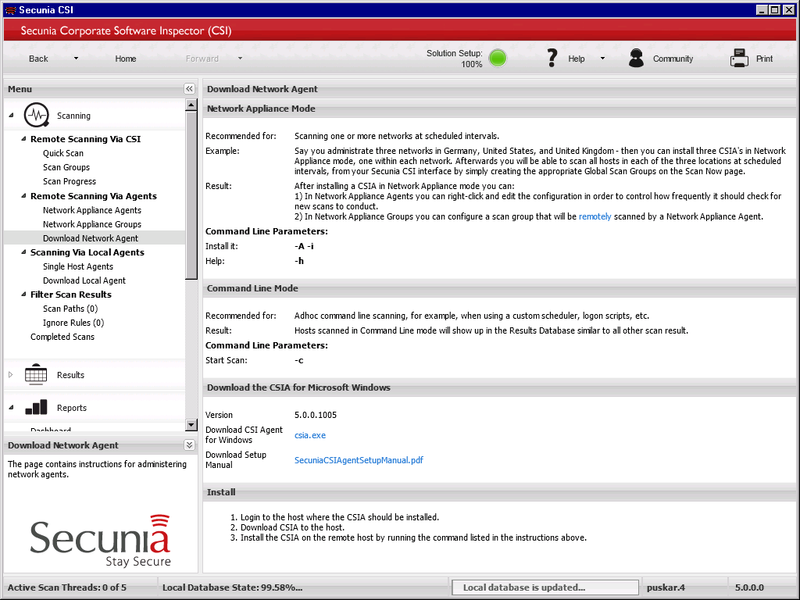 Navigate to Scanning -> Remote Scanning Via Agents -> Download Network Agent, then click “csia.exe” to download the agent. Log into the server designated for the NAA agent as the user with which you’d like to run the service. The user must be an administrator on the host and any clients that will be scanned. I did not have success with the NAA when installing the service using runas, or by configuring the service properties in services.msc. The service would start, but would not report back to the CSI Server. In CSI Console, navigate to Scanning -> Remote Scanning Via Agents -> Network Appliance Agents. After 4-5 minutes, you should now see the NAA server appear in this list. Congrats! You are now ready to start scanning and patching your network clients! Look to part 2 for configuring a Network Appliance Group, initiating a scan, and publishing a patch. This entry was posted in Management, Operations Manager 2007, SCCM, Secunia, System Center, Updates by windowsmasher. Bookmark the permalink. I would like to propose the link exchange deal with your website windowsmasher.wordpress.com, for mutual benefit in getting more traffic and improve search engine’s ranking, absolutely no money involve. We will link to you from our Fashion and Women authority site – https://www.souledamerican.com/, from its homepage’s sidebar. In return you will agree to do the same to link back to one of our client site, from your windowsmasher.wordpress.com’s homepage too (sidebar, footer, or anywhere on your homepage), with our brand name Harajuku Fever.